Real ricotta cheese is made by reheating the whey left over from cheesemaking. Most of us at home don't have easy access to a large supply of whey, but we can use milk and an acid like white vinegar to make a remarkably similar cheese that looks, tastes, and behaves almost exactly like true ricotta. The keys to getting it right lie in using the right amount of acid, heating the milk to the right temperature, and holding it there long enough for a ricotta-like flavor to develop. Heating the milk to between 175°F and 185°F (79 and 85°C) will produce a light and tender curd, without requiring a large dose of acid. Using the minimum acid necessary for a decent yield, and absolutely no more than that, ensures the ricotta tastes milky and sweet, not sour. Holding the curds at a high temperature for about 20 minutes allows a more true ricotta flavor to develop. Fill a pot with the milk. Stir in salt, if using. Heat over medium heat until milk registers 185°F (85°C) on an instant-read thermometer. Add vinegar or lemon juice and stir briefly to incorporate. Curds should begin forming almost immediately; stop stirring as soon as they've formed throughout the pot. Without stirring, continue to hold curdled-milk mixture at 185°F for 20 minutes. It's okay if the temperature fluctuates down to 175°F (79°C) or up to 190°F (88°C), but try to keep it in that zone for the full 20 minutes. 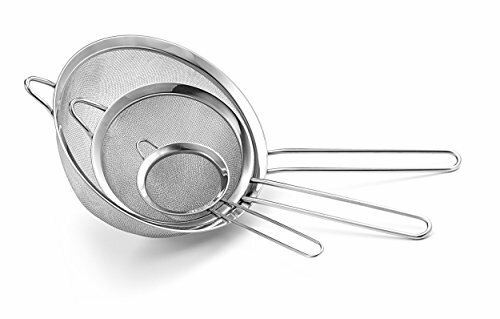 Line a fine-mesh strainer with paper towels or cheesecloth. Using a slotted spoon, transfer curds to strainer and let stand until excess liquid has drained away. Exactly how long to let it drain depends on whether you want a moister final product or a drier one. Do not try to pour all the milky liquid through the strainer, as this will clog it and prevent the liquid from flowing through. Drained ricotta can be refrigerated, covered, for up to 2 days, though it is best when freshly made. This recipe can be scaled up or down as desired. You can use pasteurized milk, homogenized milk, and/or cream-line milk, but do not use ultra-pasteurized milk, as it will not work. Distilled white vinegar creates the most neutral flavor, while lemon juice adds just a touch of lemony flavor; that can be good in some applications (like, say, if you're dolloping the ricotta onto pancakes), but may not be desirable in others. I prefer not to add salt, since the ricotta can always be seasoned later, but feel free to add a pinch if you like.